This bag comes with many bonuses for the bowler! 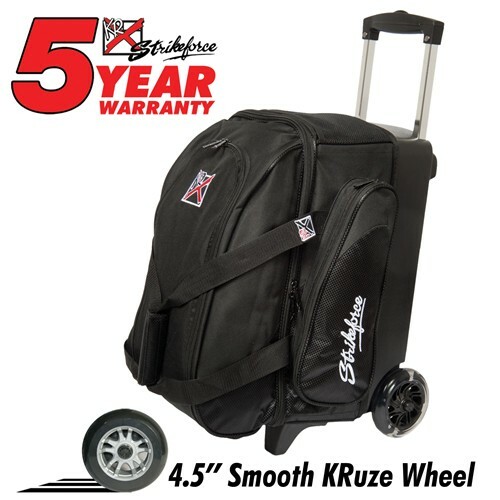 It features 4.5" wheels for a smooth ride, a separate shoe compartment that holds two pairs of shoes, retractable square locking handle, and Velcro retaining straps to ensure your bowling balls are secure. Don't miss out on this classic Black KR Cruiser Smooth Double Roller bowling bag today! Wheels: Color coordinated 4.5" Smooth KRuze urethane wheels provide a quiet and smooth ride. Shoe Compartment: Separate shoe compartment with room for 2 pairs of shoes. Accessory Pocket: 1 large side pocket. Interior: Velcro retaining straps keep bowling balls secure. Handle: Retractable square color coordinated locking handle extends to 36"
Bag could use another handle to help lift into trunk. This double roller will have molded ball cups. Due to the time it takes to produce the KR Strikeforce Cruiser Smooth Double Roller Black ball it will ship in immediately. We cannot ship this ball outside the United States.